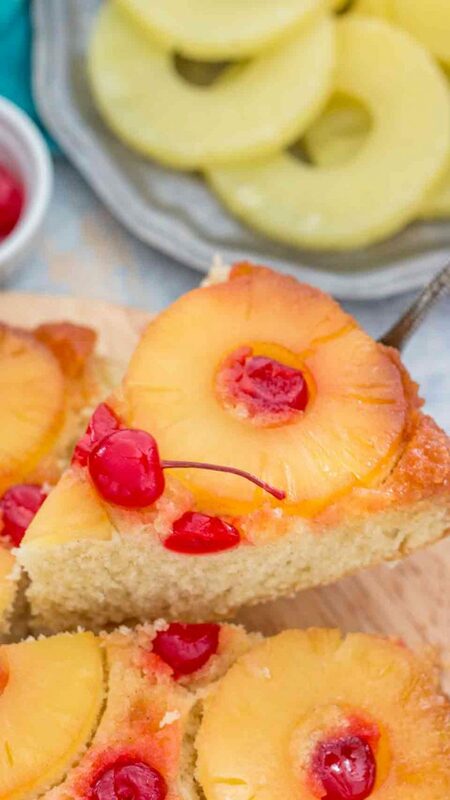 Pineapple Upside Down Cake is such a pretty and easy dessert, that anyone can easily make. 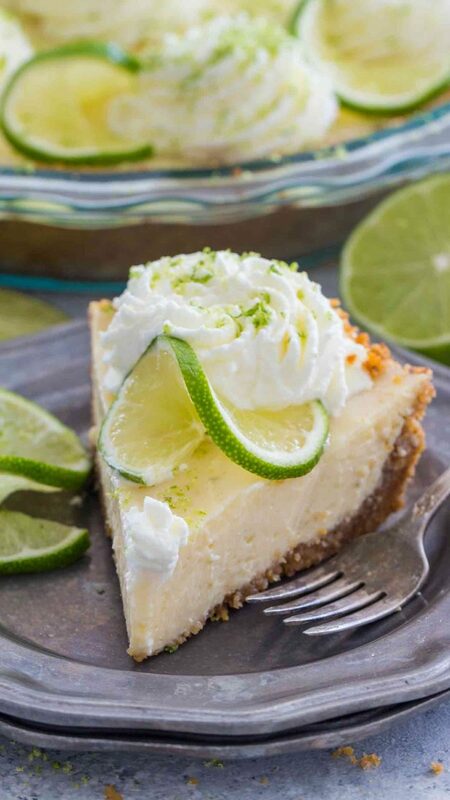 This homemade version from scratch is absolutely divine! 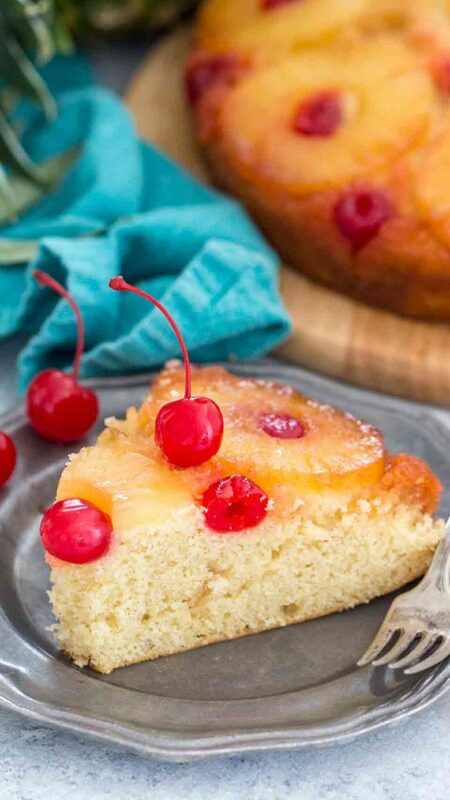 Vanilla sponge cake is topped with juicy caramelized pineapple slices and maraschino cherries to create a delicious dessert everyone will rave about! The vanilla cake turns out tender, fluffy and full of flavor. To make it even better, you can add some shredded coconut to the cake batter. It will add a punch of tropical flavor and some chewiness. If you are looking for a dessert that is very easy to make, yet looks like you spent a lot of time in the kitchen, this cake is definitely a show stopper. 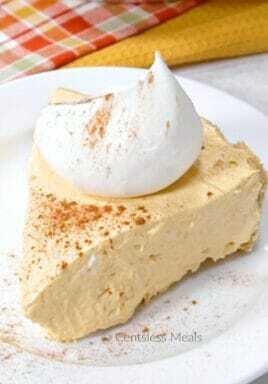 It is delicious served warm, with a drizzle of caramel and topped with vanilla ice cream or whipped cream on the side. I love easy desserts, like this timeless Almond Pound Cake and Caramel Apple Poke Cake, which inspired me to try my hands at another classic dessert, this Pineapple Upside Down Cake. The combo of the spiced vanilla cake, juicy pineapple and cherries cooked in brown sugar, is out of this world. The cake is spiced with just the right amount of cinnamon and ginger to make it extra flavorful. After you see how easy it is to make this cake, it will quickly become a favorite. What is an Upside-Down Cake? An upside-down cake is a cake that is baked with its toppings at the bottom of the pan. Once the cake has been baked and slightly cooled, it is inverted on a serving plate, and the toppings appearing on top. 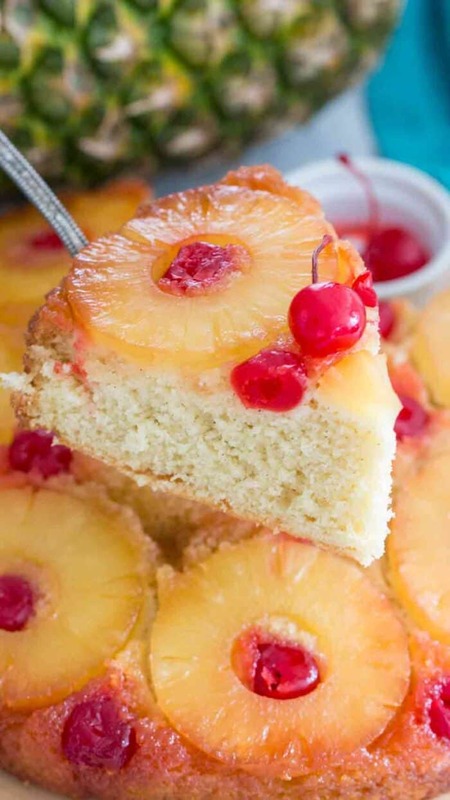 How do you Make Pineapple Upside Down Cake with Cake Mix? 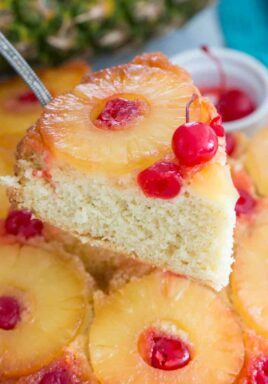 While making Pineapple Upside Down Cake from scratch is delicious, if you are short on time you can replace the vanilla cake layer ingredients with your favorite cake mix. I like to use Yellow Cake Mix, White Cake Mix or even Chocolate Cake Mix. Just prepare the cake layer per box directions and pour the batter on top of the pineapple rings and cherries. How do you Invert an Upside-Down Cake? Once you removed the cake from the oven, immediately run a knife around the inside edges of the pan to loosen cake. First, it is very important to let the cake cool for about 15 minutes, otherwise, the cake is too tender and it may break if you attempt to invert it hot out of the oven. Don’t wait too long to invert the cake. If you let the cake fully cool in the pan, it will stick to it and you will most likely break when you try to invert it. A great tip, to make sure you won’t have trouble inverting the cake, is adding parchment paper to the bottom of the pan before adding the toppings. Place a serving plate upside down over the top of pan and using oven mittens, turn plate and pan over. Remove the pan and parchment paper if using. Let the cake cool at room temperature for 15-20 minutes before serving. How do you Store Pineapple Upside Down Cake? If you have leftover cake, wrap it in plastic wrap and store it in the refrigerator for 3-4 days. What are the Ingredients for Pineapple Upside Down Cake From Scratch? This recipe calls for regular cake ingredients like sugar, butter, flour and baking powder. But the ‘stand out’ ingredients are ginger, cinnamon, pineapple juice and coconut extract. And lets not forget the pineapple slices, maraschino cherries and of course brown sugar! Many of these ingredients are staples in your pantry, so you can assemble this cake almost anytime! Other Great Topsy Turvy Recipes! Pumpkin Angel Food Cake – a delicious twist on a classic! 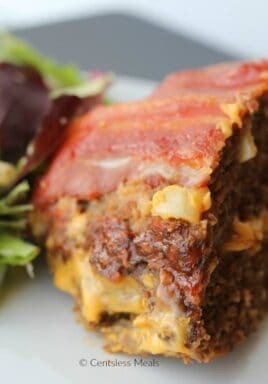 Easy StoveTop Stuffing Meatloaf recipe – Easy! 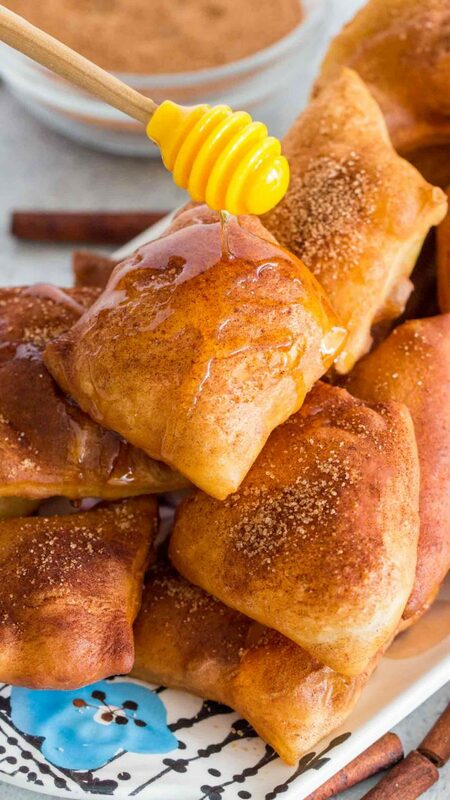 Caramel Apple Pie Bites with only 4 ingredients! Pineapple Upside Down Cake is the perfect easy dessert. Homemade vanilla sponge cake is soft and tender, topped with juicy caramelized pineapple slices. Open a can of pineapple rings, reserve 1/3 cup of the juice and discard the rest. Pat dry the pineapple rings with paper towels. Set aside. Add the melted butter to the bottom of a 9 inch square or round baking pan. Grease the sides of the pan as well. Sprinkle the bottom of the pan with brown sugar and arrange pineapple rings over the brown sugar and butter mixture. Place a cherry in the center of each pineapple ring and distribute the remaining cherries equally in the pan. Set aside. In a medium bowl combine: flour, baking powder, salt, cinnamon and ginger. Whisk and set aside. In a large bowl, using a hand mixer or stand mixer, beat butter and sugar until light and creamy. Add vanilla extract, coconut extract and pineapple juice. Beat to combine. Add half of the flour mixture and beat on medium-low speed just until combined. Add the milk and beat to combine, use a rubber spatula to scrape the sides and bottom of the bowl. Add the remaining flour mixture and beat on medium-low speed just until combined. Use a rubber spatula to scrape the sides and bottom of the bowl. Pour batter on top of the pineapple and cherries. Level the top. 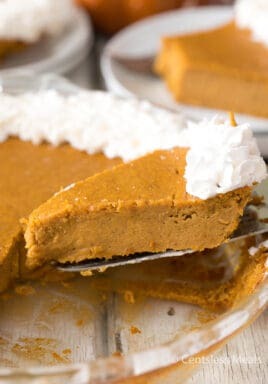 Bake in the preheated oven for about 45 minutes, or until a toothpick inserted in the center of the cake comes out clean or with just some moist crumbs attached, but NOT raw batter. Check on the cake after 30 minutes of baking first, and if the sides are already golden brown, but the cake is still not done in the center, cover with foil to avoid burning the edges and top and continue to bake until done. Remove cake from the oven and place it on a cooling rack. Cool for 15-20 minutes, before inverting the cake onto a serving platter. It is important to cool the cake a bit before inverting, otherwise it may break. After inverting the cake, let it cool for another 15 minutes before slicing. Serve warm or at room temperature.